"I thought our team played great," said head coach Katey Stone. 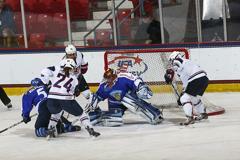 "Obviously we're pretty disappointed with the result, but their goaltender stood on her head. The kids stayed together and there wasn't any quit on our bench. That's the best I've seen us play, despite the result. We'll regroup and come out with the same determination tomorrow against Sweden." 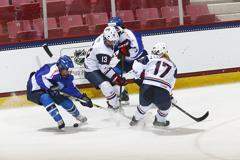 After a scoreless first period, two goals in a nine-second span gave Finland a 2-0 lead early in the middle frame. The United States didn't lose its focus following the goals, and found a way to create steady offensive chances. 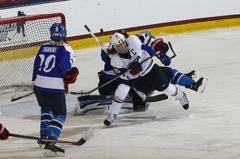 The pressure in the Finland zone eventually led to back-to-back penalties on the Finnish team, and the U.S. was able to capitalize. 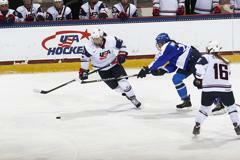 One minute into the five-on-three advantage, Team USA's power play worked the puck to Bozek at the point. 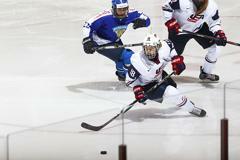 She gathered a Hilary Knight (Sun Valley, Idaho) pass and unloaded a slapshot that made its way through traffic and past Finnish goaltender Noora Raty at 13:45 to pull the United States within one. The U.S. squad continued to press, putting a total of 28 pucks on net in the second period, but Raty stood tall and helped Finland get to the second intermission up, 2-1. 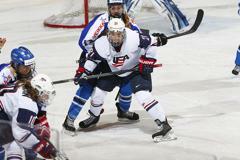 Team USA had several opportunities to knot the score in the final 20 minutes, but a Jenni Hiirikoski marker at 10:35 off a U.S. skate in front of goaltender Jessie Vetter (Cottage Grove, Wis.) proved to be too much to overcome. Bozek finished with a game-high 11 shots, while teammates Knight and Kendall Coyne (Palos Heights, Ill.) both recorded nine. 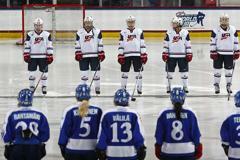 Vetter turned away 13 Finland attempts on goal. 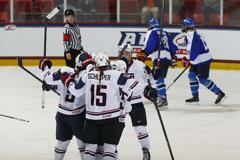 Buesser's First International Goal Sparks U.S.